SOLD OUT Saturday All Day Seminar. 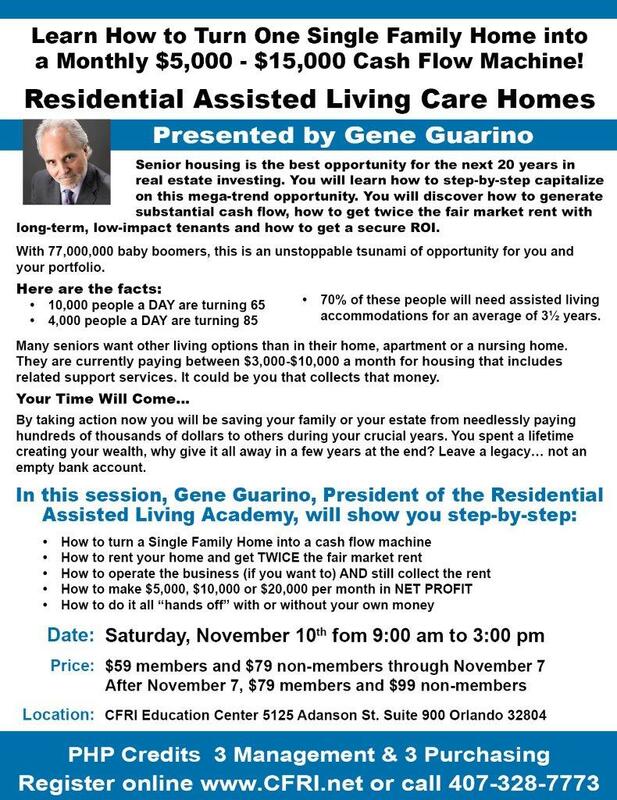 Learn about real estate investing in Residential Assisted Living Care homes with Gene Guarino, President Residential Assisted Living Academy. a Monthly $5,000 - $15,000 Cash Flow Machine! Senior housing is the BEST opportunity for the next 20+ years in real estate investing. During our all-day workshop, you will learn how to capitalize on this mega-trend opportunity. you will discover how to generate substantial cash flow, how to get twice the fair market rent with LONG-TERM, LOW-IMPACT tenants that result in SECURE ROI. Many seniors want other living options than their current home, apartment, or a (conventional) nursing home. They are paying between $3000-$10,000 a month for housing that includes some level of support services. It could be you that collects that money. It could be YOU collecting that money!! The need for residential assisted living homes is growing exponentially and the marketing is not meeting the demand. Timing is the key...this mega-trend is here right NOW!! Register today to make sure you have a seat at this GOLDEN opportunity to meet a market demand. We all know that "the riches are made in the niches."